Prep time: 15 minutes and 3 hours for gelatin mixture to set. This is a great recipe for those with a sweet tooth. The flavor of the coffee jelly does a good job of masking the smell and sliminess of the natto. The bread is optional to this recipe. I like to use toasted bread for the added texture but other variations can call for non-toasted bread, one slice of bread (eaten like an open faced sandwich), or no bread at all for a lighter dessert. The coffee flavored jelly powder used in this recipe may not be sold in all grocery stores. I was able to find it at 99 Ranch, a brand manufactured by a Taiwanese company. Individually packaged coffee jelly is also a good substitute. If you cannot find either, another option is using instant coffee with Agar Agar powder. 1. Boil 2 and a half cups of water. Mix in coffee powder and stir until all is dissolved. 2. Mix in the two packs of natto into coffee mixture, stir enough so the natto is spread uniformly in the gelatin. Remove from heat. 3. Pour the natto+gelatin mixture into a pie tin or square cake pan for cooling. I like the mixture to about 1/2 an inch deep, so I used a pie tin about 10 inches in diameter. 4. Chill mixture in refrigerator for about 3 hours. 5. Prepare whipped cream. Add heavy whipping cream and sugar into mixer of mixing bowl. Even easier with your favorite canned whipped cream. 6. Prepare bread, and assemble all components into a sandwich. 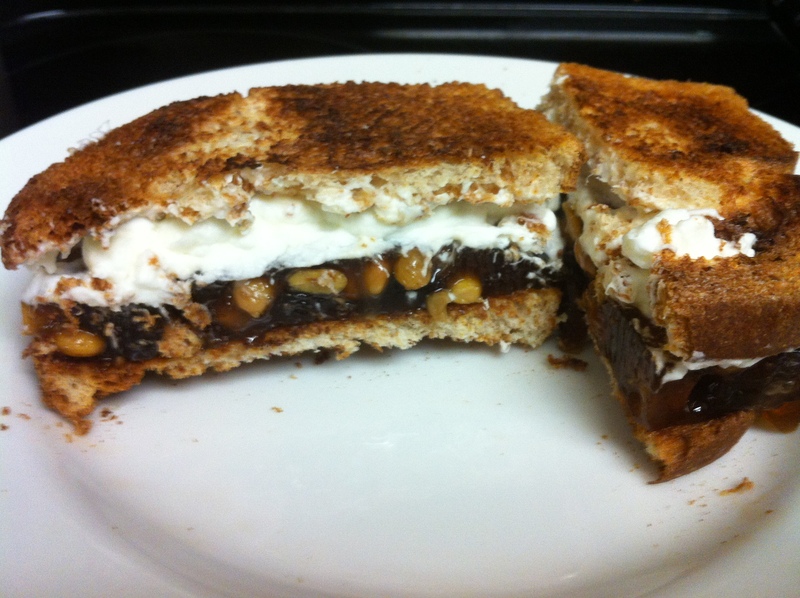 When prepared with two pieces of toast the look reminds me of s’mores, but with the power of natto. 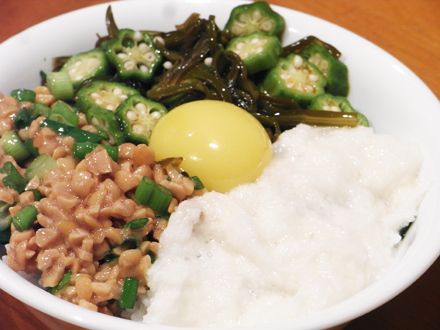 If you still know people who refuse to try natto, this recipe is a great place to start. As always try it out for yourself and let us know what you think! This is a really simple way of preparing natto. 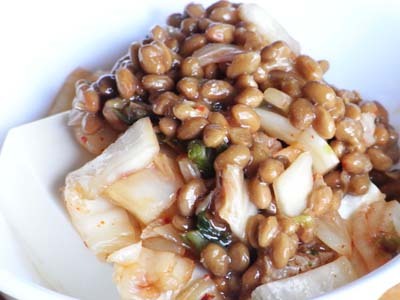 The combination of natto and kimchi make for a delicious and extremely healthy snack or side dish. Kimchi is a traditional Korean dish and made up of several kinds of fermented vegetables. It is a good source of fiber and vitamin C and is high in vitamins A, B1, B2, calcium, iron, and several lactic acid bacteria. It was only a matter of time before natto and kimchi combined forces to create an uber nutritious and delisious dish. Where can I find kimchi? You can find kimchi at most asian super markets and many larger super markets like Ralphs. However, there are several different kinds of kimchi and all are not made equal. I recommend buying it from a Korean super market if you have the choice. Cut up the kimchi into small bits and place on a plate. After mixing it, saran wrap it and stick it in the fridge for 6-8 hours. You can stick it over night or stick it in in the morning and have it later in the day. After the natto has had the chance to soak up the kimchi flavor, its ready to eat. Eat if over fresh rice or tofu or whatever you desire. 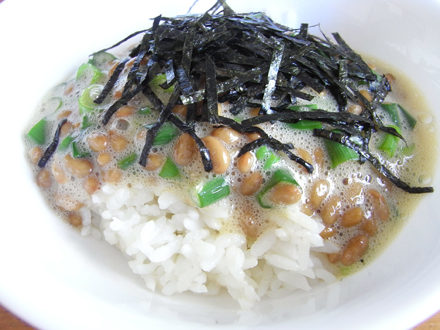 This is one of my favorite natto side dishes! Definitely try it out and let me know what you think! S&D Recipe Channel’s awesome fried rice! 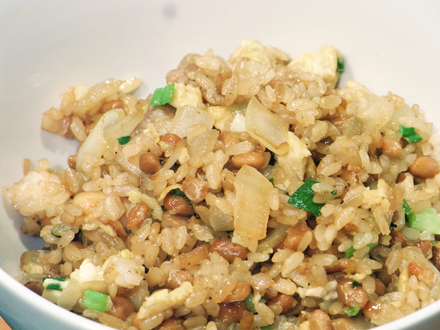 So I found a good recipe for natto fried rice when I was surfing youtube a while back. I tried it out and it was pretty good! I found it on the Simple and Delicious Recipe Channel. They have a lot of awesome looking recipe videos, so be sure to check out their channel and website. I’m going to link the video to this recipe, but the text is in Japanese, so I’ll post the recipe as well, (although I think the video is pretty self explanatory). Thinly chop the scallions and leek. Stir the natto until it gets nice and thick and mix it together with the eggs. Mix well. Heat up a pan and add vegetable oil. Move the vegetable oil around in the pan so it coats the surface, then remove the vegetable oil to the side. Add the egg and natto. Be sure to move it around so it doesn’t burn. Once it starts to solidify, remove it to the side. Again, add vegetable oil to the pan and remove any excess. Then add the rice. I like to use day old rice when I make fried rice just because its not as sticky and moist. Pound out the lumps in the rice and make it nice and fluffy. Once you do that, add the scallions and mix. Add the egg natto mixture and mix well into the rice. Add some salt and a bit of pepper to taste. Add soy sauce and the finely chopped green onion, mix it in, and your pretty much done! It’s a tasty recipe and the video really good job showing how simple it really is. Try it out and tell me what you think. 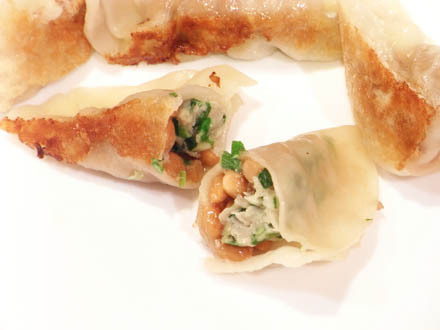 Pork gyoza with a hint of natto. Mix the ground pork, natto, chives, garlic, sesame oil, and egg white in a large bowl. You will probably have to use your hands. Add pepper and salt and mix. To cook the gyoza, heat up some oil on a pan. Place the gyoza onto the pan and cook for about 15 seconds. Then fill the pan with about a half an inch of water and seal with a lid. Let it steam for about 6-8 minutes and remove the lid. Cook until the water evaporates. Serve on a plate. For the dipping sauce, mix 1 part vinegar, 2 parts soy sauce and if you like it spicy, add a few drops of chili oil. I think the natto blends well with the pork and chives. Try it out and let me know what you think. We’re also trying to come up with a vegetarian version of this dish. Hopefully we can post a follow up by the end of this month! Natto toast is a very common breakfast meal is Japan. It’s pretty much toast, cheese and natto. I’ve tried it with several different kinds of cheese, but my favorite is mozzarella. 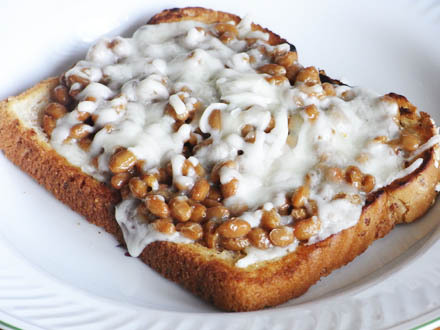 Natto and mozzorella cheese on toast! Flip the bread and sprinkle some mozzorella cheese followed by natto and a little more cheese. Toast for a couple more minutes and serve! I recommend eating it right when its served, or else the toast gets a little soggy. Natto toast is another quick and easy natto recipe, perfect for breakfast or a healthy snack. 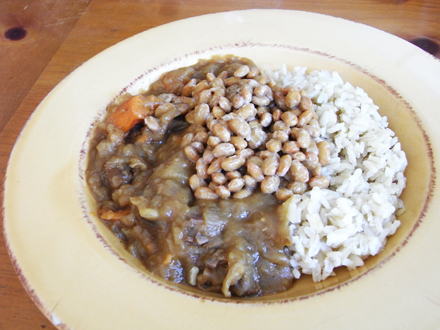 A basic hambagu recipe with the addition of natto in the center. It’s so good!! It can be eaten by itself or with rice or with curry. Thinly chop onions into small squares. Heat up the oil in a pan and saute the onions until they turn a caramel brown color. Mix the egg and panko in a bowl. Add the beef, onions, milk, a dash of pepper and salt, and mix thoroughly with your hands. When you form the hamburg patties, make sure you don’t make them too large or they will fall apart when you try to flip them. Note that adding natto in the center will make them even more brittle. Place a thin layer of the meat mixture onto a plate, then a layer of natto, and another layer of meat on top. Heat oil and saute patty for about 2 minutes. Flip the patty, add a 1/4 cup of water to the pan and steam patty for about 3-4 more minutes. Then remove the lid and cook until the water evaporates. Top the patty with Bulldog sauce or make your own sauce by mixing 1 part ketchup and 1 part Worcestershire sauce. Mustard goes exceptionally well with this meal, (I prefer spicy mustard). 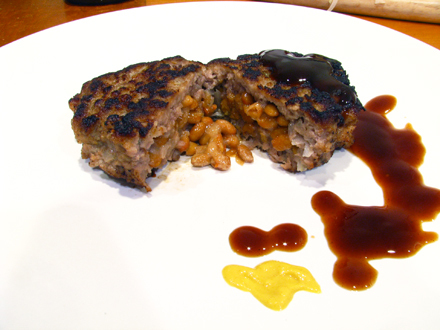 I’ve had friends who dislike natto try it and they really enjoyed it. Give it a try and let me know what you think! 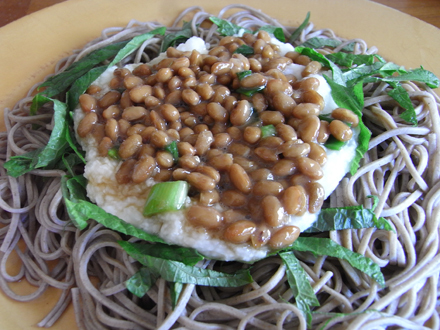 One of my favorite ways to eat natto is with soba (buckwheat noodles). This recipe is very easy to make and is very healthy. Great for a light lunch or for breakfast. 1. Boil water in a pot for the soba. 2. While the you’re waiting for the water to start boiling, chop up the shiso leaves and green onions. 3. Grate the nagaimo to make a puree, (called tororo). 4. Open the natto, add the soy sauce packet and mix. 5. Boil the soba noodles, usually for 4-8 minutes, or more depending on brand, (read and follow instructions on the back of the soba). 6. Take the soba out of the boiling water and rinse under cool water. 7. On a separate plate, place the soba, shiso, tororo, natto and green onions. 8. Pour on some diluted mentsuyu, (2 water to 1 mentsuyu), over the whole thing and enjoy! This is a simple curry recipe using a ready-made curry base. Natto goes great with curry. Most Japanese curry restaurants will have natto curry on their menu, so if you don’t have time to make your own, you can try ordering it. Natto curry also makes a great vegetarian dish without the beef. 1. Heat up oil in a pot and add the thinly sliced onions. 2. Once onions are soft and caramel brown in color, add the chopped carrots, apple and 3. potato with 4 cups of water. 4. Let it simmer for about 30-40 mins, (but make sure you stir frequently if you are using a pot with a thin base for it will burn the vegetables), and add water if it is evaporating too quickly. 5. Add the curry cubes and chocolate and stir until both are completely dissolved. 6. Let it simmer for another 5 mins. If curry is too watery, let it simmer for longer to let some water evaporate. 7. Serve the curry over natto and rice. Some people like it with just natto. This is an awesome recipe submitted by my friend Kazumaki5. I tried it myself and I loved it. It is a very simple recipe, high in protein and very healthy. It is ideal for breakfast or as a snack between meals. Natto and raw egg over fresh white rice. 1. Crack the raw egg into a bowl and mix. 2. Add the 3 packets of natto and the green onions and mix well. 3. Pour the mixture over fresh white rice and top it off with some nori. 4. If you feel like it needs some salt, you may add a bit of mentsuyu or soy-sauce.